NEW YORK — Jorge Linares was one fight removed from a notable outing, a stoppage loss to Vasyl Lomachenko, when he came to the ring at The Hulu Theater at Madison Square Garden. Linares, age, 33, was TKO’d in round ten versus Loma, but drew props for giving a more than solid account of himself against the technical wizard from Ukraine. He rebounded with a win over Abner Cotto, and on Friday, engaged with Pablo Cesar Cano of Mexico in a WBC junior belt outing at 140 pounds. The WBC International silver beltholder Cano came to the table younger at 29, but saddled with journeyman status. That status has been enhanced somewhat after his one round, three knockdown performance which saw the referee call the bout at the 2:48 mark. Linares (45-5, 28 knockouts) was getting battered and was backing up, with boozy legs, and the ref hopped in. Golden Boy matchmaker Robert Diaz told RING after that he knew Cano (32-7-1, 22 KOs) was having a helluva camp, and had said hours before that this was a 50-50 fight. Diaz added that he figured 135 pounds, not 140 pounds, was where his future in the sport lies. All of Linares’ losses have been by stoppage, and this is Linares’ second time to lose in the first round after Juan Carlos Salgado accomplished the same finish back in 2009 at 130 pounds. Now, Linares will rest. Then, see if he can make 135 again, because 140 maybe isn’t for him, Diaz said in so many words. But first, rest and restoration is in order. As for Cano, Diaz said that Jose Ramirez might be wanting to give Cano a shot at his WBC world title. 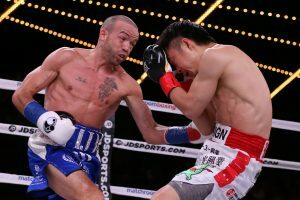 TJ Doheny, an Irish born Aussie resident made his first successful defense of the IBF junior featherweight title, stopping Ryohei Takahashi in round eleven. In the first, Doheny, a lefty, showed solid aggression and the title challenger went to his corner exhaling like the first round had gone six minutes. In the second, we saw cuts on both fighters. The side bridge of the nose was sliced on Takahashi and Doheny’s slice was in between his eyes. But as he said afterwards: “It’s not a TJ Doheny fight without a cut.” The blood didn’t flow in the third, and then some drama…TJ got credited for a knockdown. A right hook hurt Takahashi, he held on but got swatted to the canvas. In the fourth, Doheny got the nod, with his volume and sharpness. In the fifth, Takahashi (16-4-1, 6 KOs) wanted to get grittier and press the Irishman. Not as easy in practice as theory; Doheny skipped and slid and popped the Japanese boxer, who was a step or two behind in the sixth. 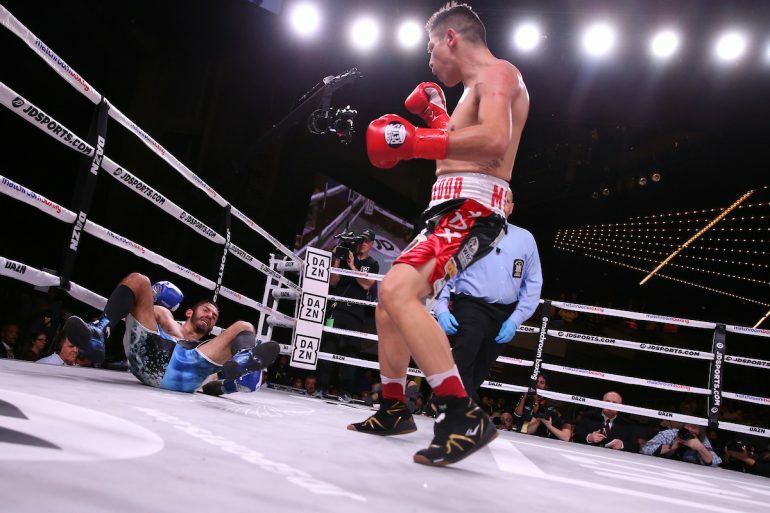 In round seven and the eighth, Doheny kept on proving his skill set edge. And to the end….the ref halted it, pulled the plug after about eight blows went unanswered in round 11. The loser didn’t protest, either, signifying Michael Ortega did the right thing. The end came at the 2:18 mark. Doheny won the stat war, 191-80 in punches landed, 713-583 in punches. Doheny didn’t have to look far for the fight he wants next. Danny Roman, the WBA titleholder, was in attendance, and Doheny called on his new promoter Eddie Hearn to get that fight made.